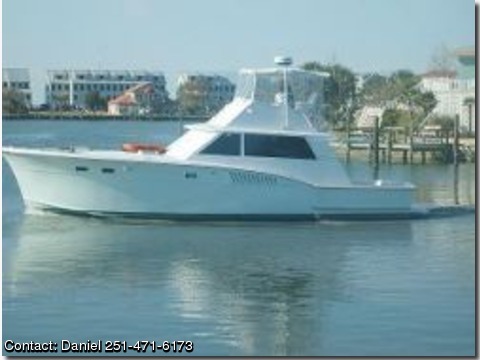 The 45' Hatteras is the perfect cruising vessel. She has three staterooms, galley up, large cockpit and enclosed flybridge. The generator is new Mase/Yanmar 14.5kw with sound shield. The Furuno Radar 834 C is new. Heat Exchanger have been recently serviced. This beautiful classic is ready to go.JUST REDUCED. EQUIPMENT: Standard Horizon VHF w/ Distress(NEW) Danforth Compass Simrad Autopilot-Interphase w/Plotter 6 Man Life Raft Furuno 1834CI GPS, Plotter, Fishfinder, Depth and Radar Mounted on Swivel Ipod. (NEW) Garmin GPS 120 Stereo, DVD, Amplifier RECENT IMPROVEMENTS: Rebuilt engines and transmissions New Exhaust Risers, Starter, Alternators with new Exhaust hoses to transom New refrigerators New windows and frames All exterior aluminum is new New headliners Heads replaced All screw on filters All hoses replaced New AC Units New Battery Charger Fresh Paint 2003 New rub rail and lifting rail New ice maker New carpeting New dinette New teak table in salon New counter tops New canvas and Eisenglass.